Nearly all ornamental plants suffer infection of the fungal disease known as powdery mildew. Japanese maple trees are likely to survive an attack, although the disorder can be unsightly. A white fungus known as powdery mildew is one of several leaf diseases prone to attacking the brightly colored Japanese maple tree, Acer palmatum. "Japanese maples may be troubled by anthracnose, powdery mildew, leaf spot, leaf scorch, root rot, aphids, scales and borers," according to the Clemson University Extension service. Powdery mildew appears as a white or gray fungal substance throughout the leaves, stems, flowers and fruit of a plant. The Ohio State University Extension service notes that leaves may curl or twist even before the white fungus is apparent. "Severe powdery mildew infection will result in yellowed leaves, dried and brown leaves, and disfigured shoots and flowers," according to the OSU website. 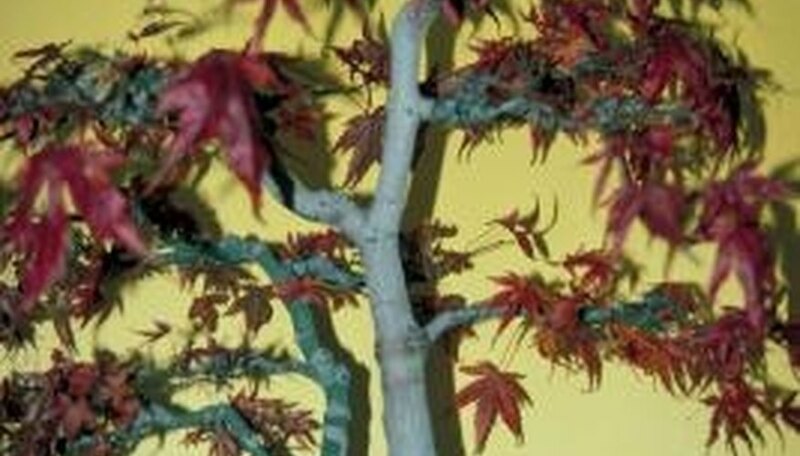 The disease rarely results in fatality to a Japanese maple, but it may increase the likelihood of leaves falling prematurely and the tree moving into fall dormancy earlier than normal. Trees typically suffer infection when temperatures range between 60 and 80 degrees Fahrenheit; powdery mildew normally does not appear during the extreme heat of summer.